3 bedroom, 2 bathroom villa in the Sunridge Woods community. Owned by Julie Hall. Ref: 611. For privacy reasons, the marker on the map shows the Sunridge Woods community location and not actual villa location. 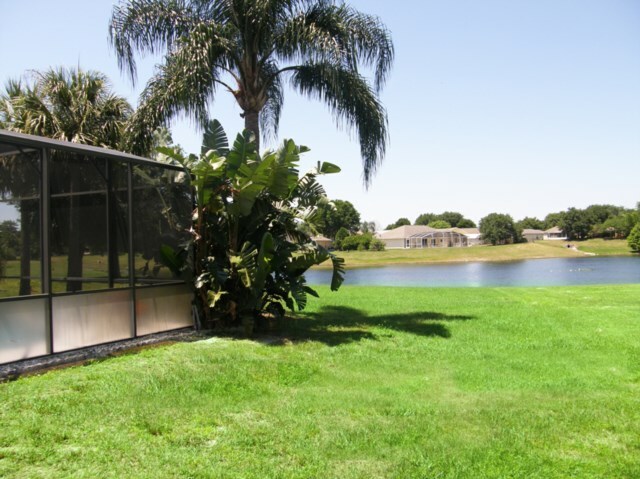 Fantastic property with private screened west facing pool with Jacuzzi overlooking a lake (wonderful sunsets). Set in a beautiful location. Plus Games Room - Billiard Table, Foosball and Table TennisComplimentary wireless internet access. Newly furnished to a very high standard. Fully equipped. Plus DVD/CD, Playstation 2. Selection of DVDs and games to play to suit all ages. Family room, also dining room and living room. Kitchen with breakfast nook. Two twin beds - Disney Themed room. Monitored security alarm - pool door safety alarmed. Our house, has been fitted to the highest standard. 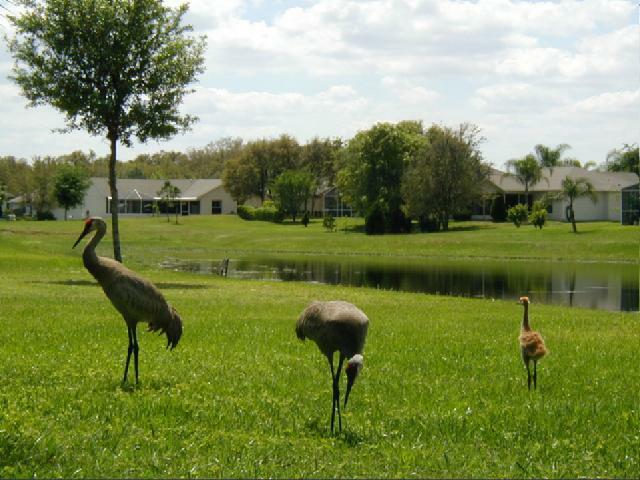 Situated on the peaceful community of Sunridge Woods where there is a good balance of holiday and residential homes, you can experience the real Florida. 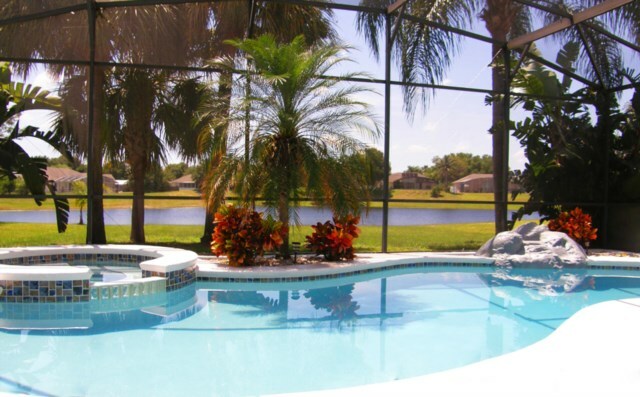 Beautiful screened pool with Jacuzzi overlooking a lake to sit and enjoy the Floridian sunsets. 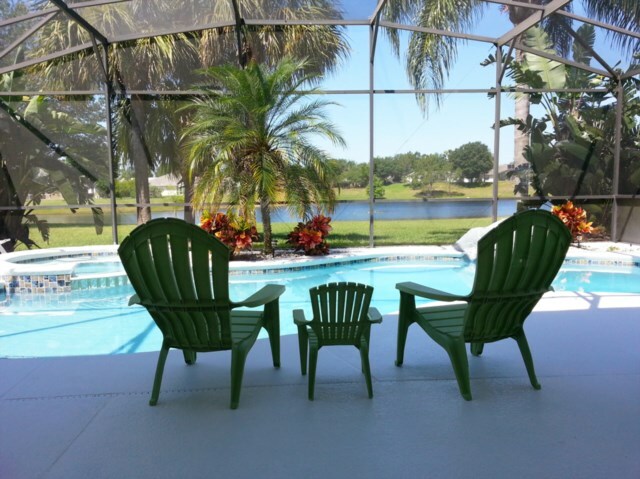 Our house is ideal for a relaxing independent holiday and yet is still close enough to Theme Parks (Disney 10 mins), Golf, and all the amenities of Hwy 192. 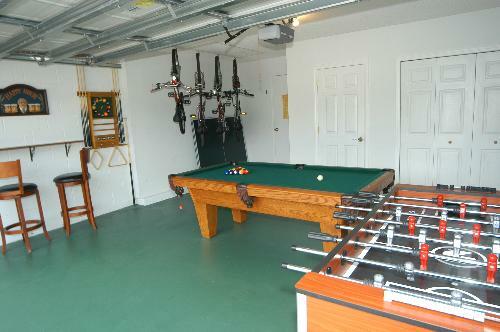 GAMES ROOM - Billiard Table, Fooseball Table and Table Tennis, fishing rods and bikes. 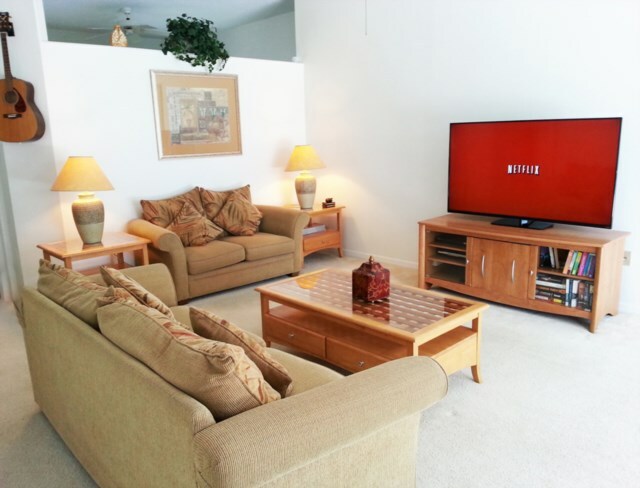 The family room is a nice place to relax, it overlooks the pool to the lake beyond. This is where you will find the entertainment centre: Large TV, DVD/CD PLAYER - PLUS LIBRARY OF DVDS. Playstation 2 WITH GAMES. The kitchen is fully equipped. As well as a conventional oven and hob there is a microwave oven, a large fridge/freezer, dishwasher, waste disposal, coffee maker – everything you would expect to find in a modern kitchen ready for your stay. Ample crockery and cutlery, cups and glassware for dining inside as well as non-breakable plates and beakers ‘glasses’, for safe alfresco eating around the pool. 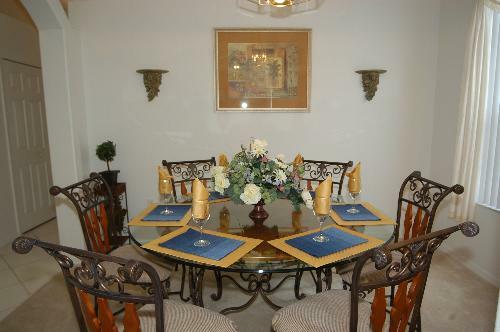 There is a breakfast nook just off the kitchen, with a table and six chairs which overlooks the pool. A large washing machine and tumble drier are provided, along with an iron and ironing board. There are also two hairdryers at the property. 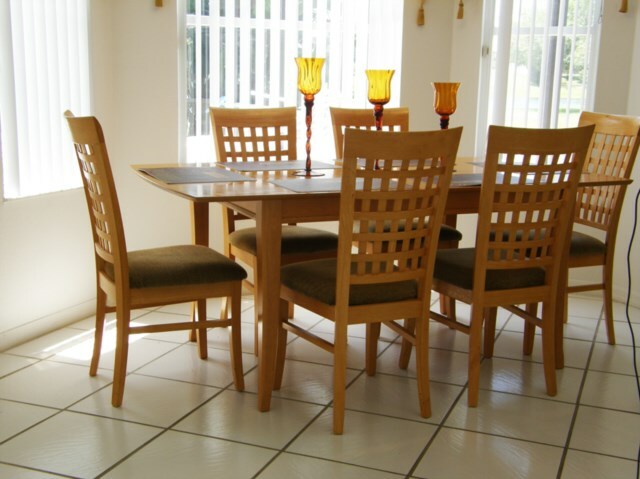 For more formal dining a dining table and chairs with six place settings is located in the formal dining room ready for your use. 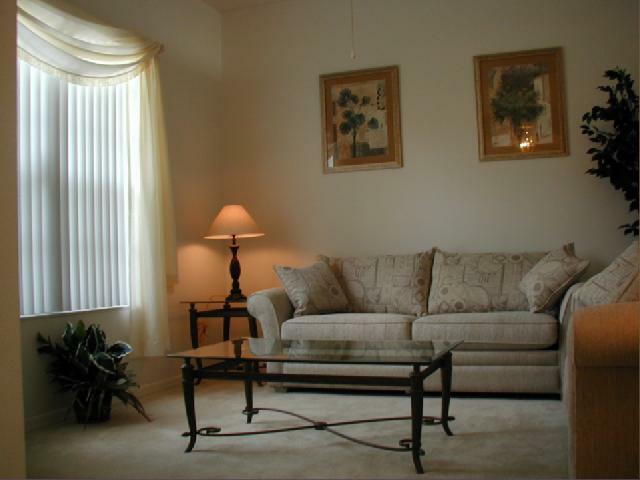 Next to the dining room there is a separate living room, a quiet area separate from the family room. This room also contains a sofa bed for use when accommodating 8 people. 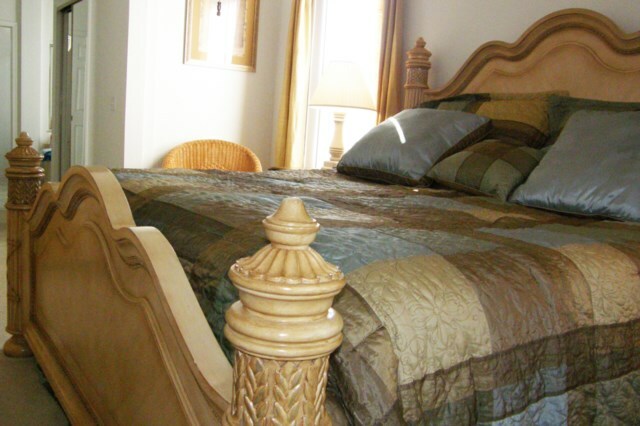 The Master Bedroom has a King Bed with a huge 16" deep-pocketed mattress for your extra comfort. Luxury comforters and fittings, en-suite bath and separate shower. Your own multi channel TV / DVD player, clock radio, two large walk in wardrobes. This room has views over the pool and lake beyond. 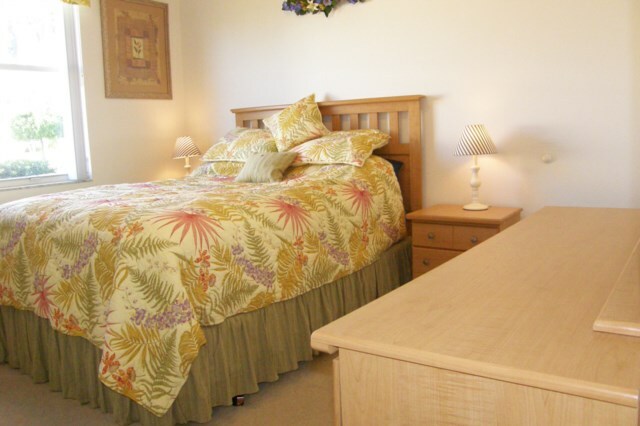 The second bedroom has a Queen bed with deep 16" pocketed mattress, multi channel TV and a clock radio and shares a 2nd en-suite (Jack and Jill) bathroom/shower with the third bedroom. 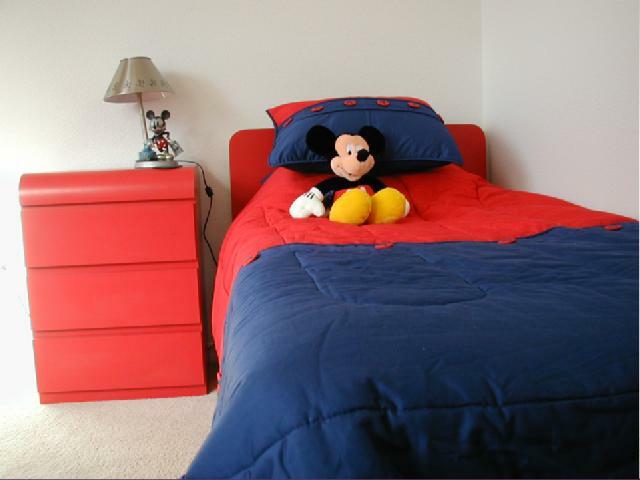 The third bedroom has two twin beds and is decorated with a ‘Disney’ theme. As with all rooms there is ample built-in wardrobe space and storage drawers. Plus a T.V/Video Player. 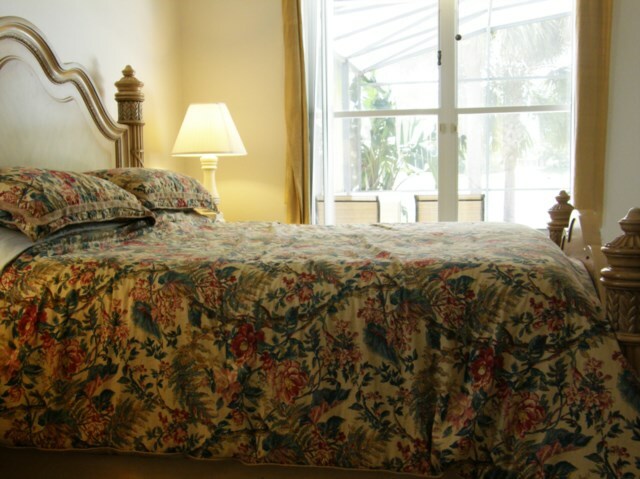 Extra bedding and towels (plus separate pool towels) are provided. 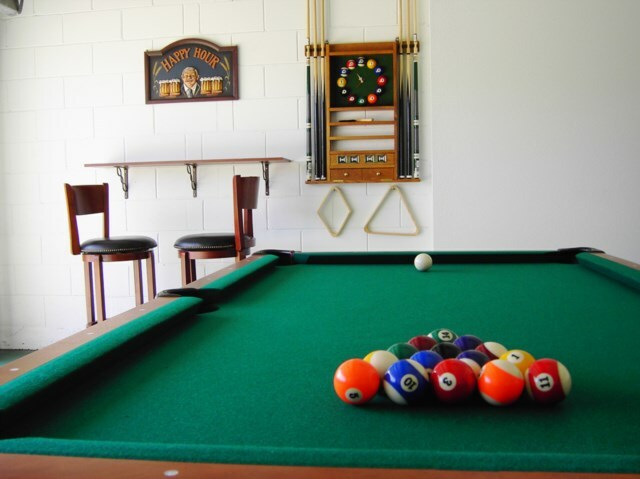 Your own Games Room with - Billiards Table, Table Tennis and Fooseball, fishing rods and bikes - FREE use available to guests. 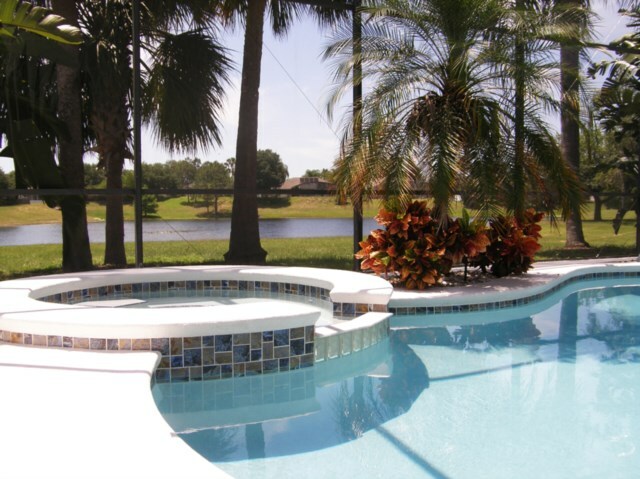 The Garden and Pool / Jacuzzi is beautifully surrounded by lush tropical plants and overlooks a lake. There is plenty of patio furniture - including tables, chairs and sun beds/loungers. There is a BBQ Area outside the screen -FREE use of BBQ. A pool door alarm is provided as part of the house security system (children must be supervised at all times near water). High Chair and travel baby crib/playpen FREE to guests-please bring your own baby linen. 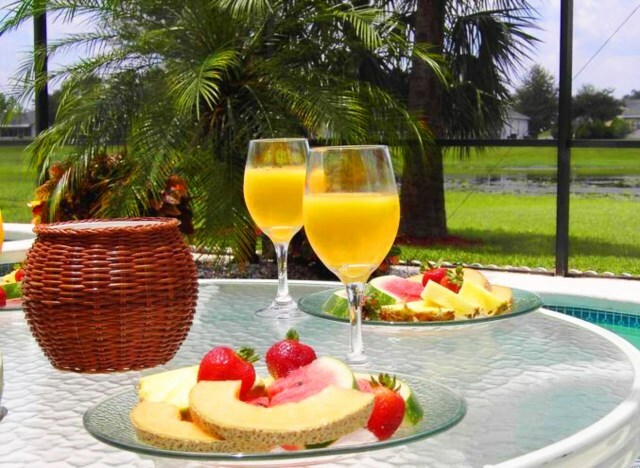 Once you have experienced our fabulous home in the sun and enjoyed the relaxation and flexibility you have, you will want to return again and again. I would just like to echo Andys comments. The villa was absolutely fantastic. We couldnt quite believe it when we opened the door, it was spotless and far exceeded our expectations. We loved the location and the fact that it was in a residential area gave it character. We had passed other villa areas during our time but some appeared soulless and appeared to lack the qualities that Sunridge Woods has. We also loved the Champions Gate complex. The pool was amazing, as was the view from it - priceless. Charlotte and Ben would have been quite happy spending 3 weeks there. Many times at the parks they would ask when we were going back to the villa! We all became fond of the chit chats and the squirrels. For me the highlight of the holiday was the villa. A glass of wine after a long day looking over the lake is a memory I will never forget. Departure day was a very sad time indeed for all of us. As we drove away I took one look back and said to Andy We are coming back. 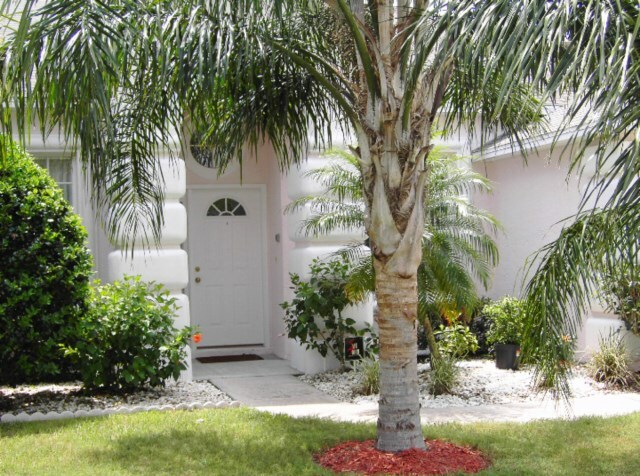 Low season prices from $958.00 / £749.00 per week. 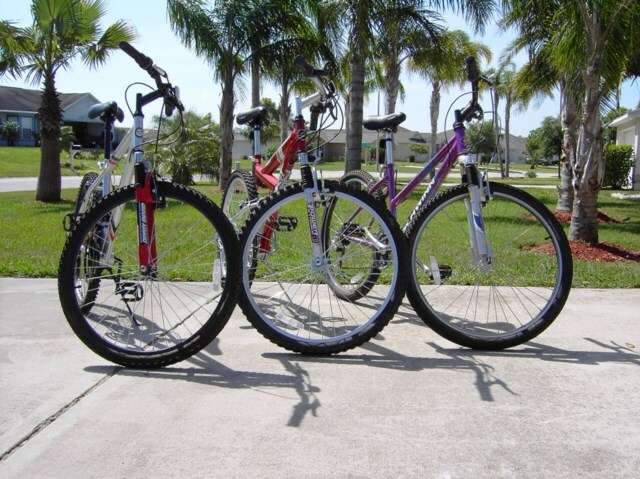 Peak season prices from $958.00 / £749.00 per week. 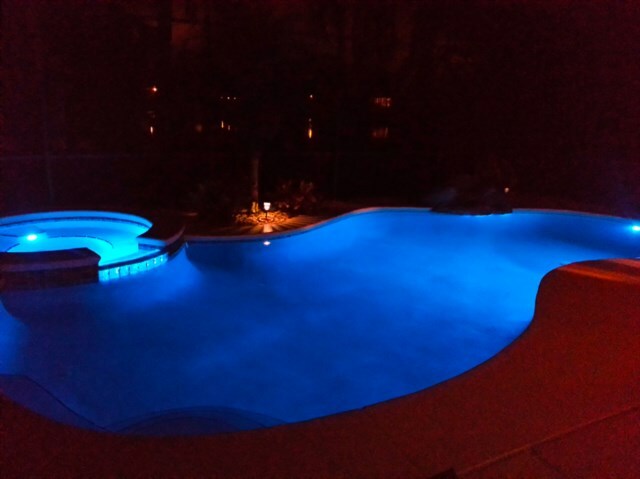 Pool heat optional at $209 per week (recommended October thru April). Your enquiry will be sent to villa ref 611 only. This page has been viewed 24445 times since 25 Feb 2003.